In a recent project, the Kimpton Planned and Preventative Maintenance team completed on a large scale industrial application, the chilled water had become highly acidic. 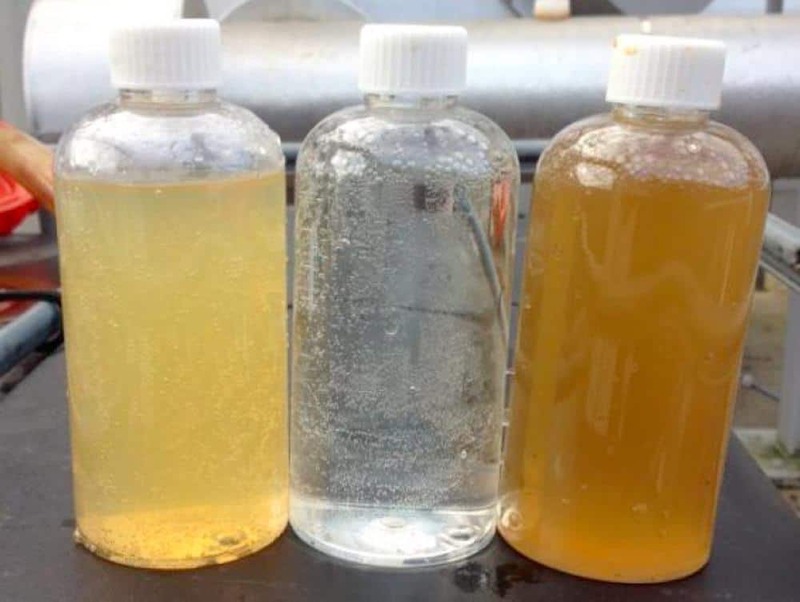 This left us with two options for the treatment, which were to either completely flush the system or to treat the water within the system and add in additional filtration to eradicate the problem. A complete flush presented huge logistical and operational issues. The closed loop system contained over 44,000 litres carried through an 200mm steel ring main and the waste fluid could not be allowed to waste locally for fear of infection to nearby interceptors. The system could not be shut down, without serious risk to the machinery that it had been designed to service. Purging that amount of water through the system, would have required four water tankers at the inbound and outbound ends, with no guarantee of success. It may have delivered short term gains, but the risk of re-acidification was still present without removing the underlying cause. So, what was the situation with the water in the system? There was clear evidence that the Glycol within the system had broken down and become sludgy. When this happens, the specific heat capacity of the fluid changes and therefore its ability to ‘heat transfer’. Glycol is used to prevent freezing, but does also make the water potentially susceptible to Microbial attack, in the form of Pseudomonas that feed on the Glycol. When the water becomes viscous, it’s therefore more dense. This means it will begin to decrease the flow within the system and risk damage to the pumps that power it too. They have to work harder to push the contaminated fluid around the system. The breakdown of the glycol also makes it susceptible to freezing within the system, which can cause serious damage to the chillers and pipework. There were also signs of corrosion within the system. The steel pipes were beginning to show signs of damage, that resulted in high levels of suspended iron and other solids, due to the corrosive conditions. With all of this ‘breakdown’ within the system, the inhibitor levels were also seriously depleted. Redosing with new inhibitor would be pointless at this stage, as it would be broken down again by the corrosive environment. So the solution proposed was…. Firstly, treat the water whilst at the same time deploy a side-stream filtration system to remove the build up of particulates and solids within the system. The first approach with acidic liquid within a closed loop system is normally to treat it with Peroxide to raise the alkaline levels. In this case, the additional Pseudomonas within the system meant that this would again be ineffective and quickly undone. Biocides were therefore used to kill the Pseudomonas. At the same time the inhibitors were restored after treatment with Nitrites, which allowed them to be brought back to their correct levels and reintroduce some level of protection. The side stream filtration pulled a high percentage of the suspended solids from the system. Initially we were having to flush every 12 hours or so, but after two weeks of ongoing treatment, the water within system was restored to its former stable condition. 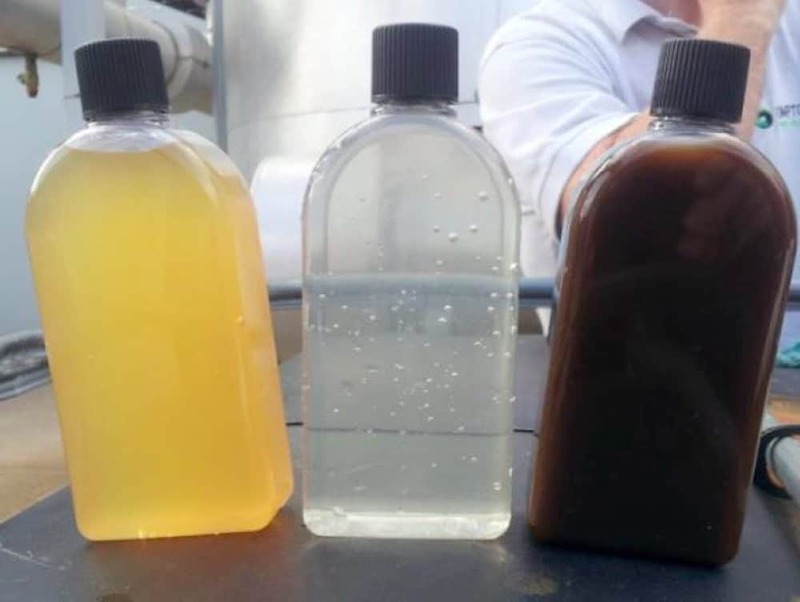 You can see from this early photo, the levels of suspended solids within the backwash in the right hand bottle. And then from this later image two weeks after the treatment regime was implemented, the filter inlet water is completely free of solids and ‘honey’ coloured. The filtered water is perfectly clear and the backwash is healthy enough to only require routine filtration. So in summary, treatment of chilled water may not be something you think about every day. Failing to make it a priority can however cause enormous damage to your entire system and could impact on your business. With a little help from your friends at Kimpton. If you have a closed loop chilled water system, speak to one of the Kimpton team on 0151 343 1963, we can give you more details of this case study and show you how we can make your chilled water system something you never need to worry about again.